The tutorial is easy to follow. 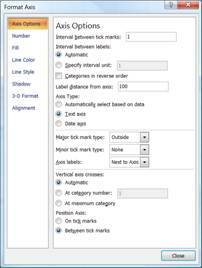 It is a smart way to graph in excel! Best tutorial available. Simple, easy to understand -- perfect! Thank you very much. It is indeed helpful and easily comprehensible. A fairly common chart that is not a default Excel chart type is the stacked cluster chart or a side-by-side stacked column chart. In this chart the data are both stacked and clustered. Excel, out of the box, can do one or the other but not both. This tutorial shows how to cluster a stack in a chart. Such a chart has 2 or more sets of data in 1 stack and 2 or more sets of data in one or more adjacent stacks. An example is shown below. 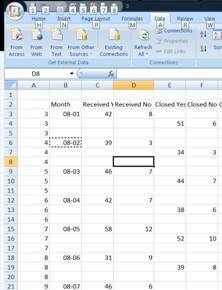 The snapshots in the tutorial apply to Excel 2010 and Excel 2007. The technique will also work with Excel 2003. Plot the above in a stacked column and the result will be stacks containing 4 elements. That looks better but is not quite right. 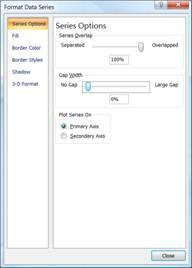 We could eliminate the gaps by setting the Gap Width to 0 but the result (see below) will still not be right. The corresponding chart is what we are looking for. Even though we have what we want how long did it take you to reorganize just 4 rows of data? Imagine doing it with all the rows! Here's how we do it quickly. 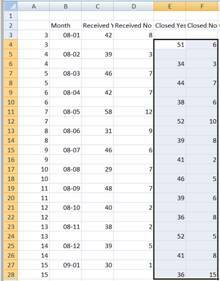 Given that our data are in B3:F15, in A3 enter the formula =ROW() and copy it down to A4:A15. Copy A3:A15 and paste back the values. Next, paste the values into A16:A28. Repeat the paste in the range A29:A41. Next, select the range A3:F28 -- leave rows 29:41 alone -- and sort on column A ascending. 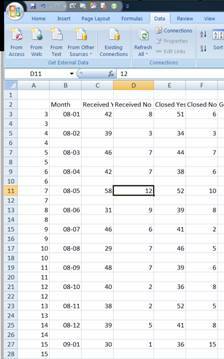 To move the contents of col. E and F down 1 row simply select E3:F27 and drag the selected range down 1 row. Clear the contents of column A since they are no longer required. 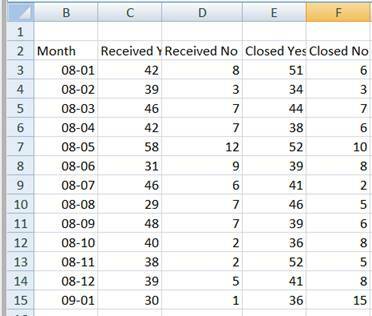 Select the data range and create the stacked column chart. 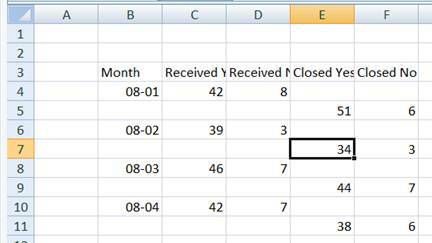 It might help to temporarily delete the 'Month' literal from cell B2 (Excel will then treat the 1st column as the x values). 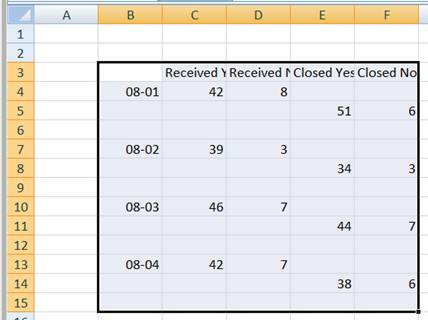 Again, remember to (1) set the type of the x-axis to Text (or Category in Excel 2003 or earlier), and (2) change the Gap Width to 0.